The Firstborn - excitingly for her alone - is this evening setting off on the second part of her Great OE, the EU and GB bit of it this time, and in the card we gave her I found myself impelled to write, amongst all the other obligatory mother stuff (Stay safe! KEEP IN TOUCH!!!) the instruction to 'Learn lots'. To me, that's a really big part of travelling - not sunning yourself on the Costa Brava, not partying into the small hours in Berlin, not scouring the Oxford Street shops. It's not as snobbish a distinction as that makes it sound: it's just my thing. I like to find out stuff. And then, once having found it out, it becomes part of me and when someone else gets it wrong, well. There's only one response. You have to correct them, don't you? Well, you do if you're a natural-born pedant whose nit-picking impulse has been further honed by being a teacher, and then an official describer of places and what you'll find there. So when I read this news story this morning about some Kiwi guy doing a Forrest Gump, running across the US from Santa Monica pier to New York, beginning with Route 66, I had to send the paper a Must Do Better tweet when I saw the map. Look at it! That red line is nowhere near Route 66! Having been to both ends of what those of us in the know call the Mother Road, I can confidently state that yes, it finishes at Santa Monica - but it begins in Chicago. I've seen the signs - I was there when the one for the Chicago end was unveiled, somewhat belatedly - and now, so have you. So we can both tut and shake our heads, and feel superior. And not think for a moment that there's any sort of contradiction at all between this and the theory that travel broadens the mind, and increases tolerance and compassion. This made me sing the Route 66 song backwards. If he's starting at LA, he'd see Barstow, Kingston, Gallup New Mexico, Winona, Flagstaff Arizona, etc ... And it does look like he makes it to Joplin Missouri and "Saint Louie." He just doesn't head north to Chicago. 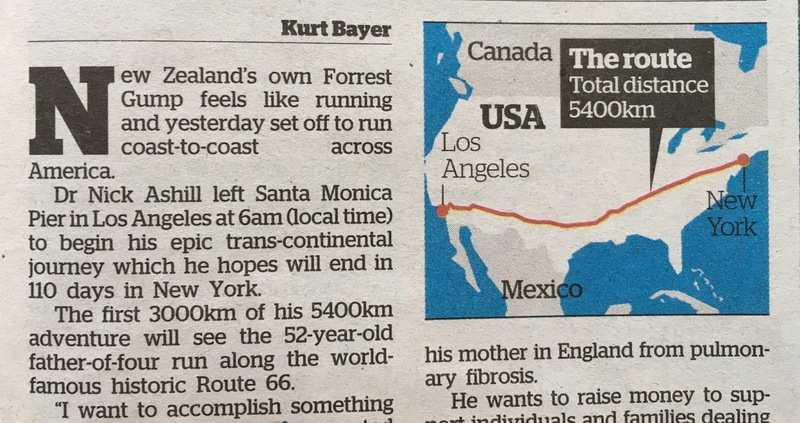 I suspect that the Herald minion who did the map is much too young to know that song and just drew a random line across the US. I'm sure the guy who's doing the running knows the proper route.